Dedicated to the universal mother goddess, Kamakshi who is also a form of Tripura Sundari or Parvati, the Kamakshi Amman Temple is perched in one of the most historic towns of Tamil Nadu, Kanchipuram. 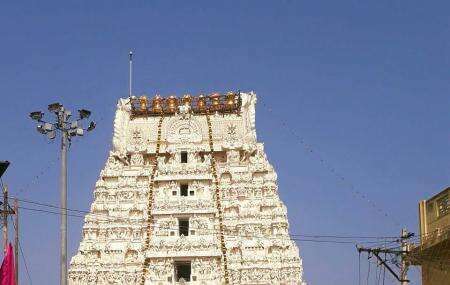 Other popular temples, form the same institution include The Meenakshi Temple in Madurai and the Akilandeswari temple in Thiruvanaikaval near Tiruchirappalli. You can head here to witness four poojas, aratis or worships everyday along with the one of the biggest festivals in the state the Ther. This festival is held in the months of Spring, from mid-March to mid-April. Along with this festival, the float festival too is a highlight of this temple. Fridays and the festival of Navratri too is celebrated on a large scale here. How popular is Kamakshi Amman Temple? People normally club together Kamakshi Amman Temple and Ekambareshvara Temple while planning their visit to Kamakshi Amman Temple. People also prefer to start their day with Kamakshi Amman Temple. Good place and neatly maintained. But in day time it's very very hot and we can't walk in that hot floor. They've to made some arrangements for this. Young people are running but what about old peoples. How they walk. My mother struggled too much. And the security peoples also not allowing to sit or stand in shadow. Either you've to stand under hot sun or go out of the temple. They arranged mate also in temple. But that also very hot. You can't walk on that too. Feel same heat in that like ground. We Visited there at morning 11 AM. So better visit there before 10 or after evening. Excellent place! Gives us peace! Crowd is usually high on weekends and on Tuesdays and Fridays! Will recommend visiting! It also comes with excellent sculptures and lighting in the evening! A very popular and one of the best maintained temple. Goddess is very popular. It takes anywhere between 1 or 2 hrs to see her on account of heavy crowd on most days. Facilities are very good. The entire temple complex is neat and clean. Parking available our side. It is sometimes challenging to get parking close to temple. Wheelchair facilities available. Adequate drinking water available. Good temple, to visit, there is limited lunch provided to people , you will get it if you are lucky. Temple closed between 12 to 4. Most temples have multiple entry points. Make sure you remember where you entered, 50 RS parking fee for cars. Leave slippers in the car and be prepared for the hot surface and a lengthy walk. I went on Sunday and we were done in 30 min. Divine feeling for sure.